* Share price as of close on July 13, 2016. This Bridge Report provides details of Nihon Enterprise Co., Ltd. and information pertaining to earnings results for the fiscal year May 2016. Nihon Enterprise is a "mobile solutions company" with two main business segments including the Contents Service Segment, where various contents including traffic information, entertainment and lifestyle services are created and distributed to smartphones and other mobile devices, and the Solutions Segment, where contents creation, operations, systems creation, affiliate advertising, reverse auctions, IP phones and other business support solutions (Cost reduction) are provided. Furthermore, Nihon Enterprise is also promoting efforts to expand its contents business from Japan into overseas markets and has established a business platform for the provision of Japanese contents in China and India. The Nihon Enterprise Group is comprised of a total of nine consolidated subsidiaries with seven within Japan including the company Dive Co., Ltd., which provides advertising business, At The LOUNGE Co., Ltd. which provides music related services, Advanced Traffic Information Services, Corporation (ATIS Corp.), which provides traffic and other information services, 4QUALIA Co., Ltd., which provides web and mobile site development and maintenance services and contents development, HighLab Co., Ltd., which conducts native application development as part of the mobile contents business, and One Inc., which provides voice communications related solutions, and Aizu Laboratory, Inc., which conducts smartphone application planning and development. The two overseas subsidiaries include Enterprise (Beijing) Information Technology Co., Ltd., which oversees the operations in China and operates cellular telephone retail shops, and Rice CZ (Beijing) New media technology Co., Ltd., which provides IT related educational services in China. Sales rose by 8.1% year-on-year to ¥5.530 billion during fiscal year May 2016. Weak sales of contents sold to carriers due to dilution of advertising effectiveness caused sales of the Contents Service Segment to decline by 12.4% year-on-year. Higher sales recorded in the solutions (Consigned development and others), advertising (Advertising agency services), and overseas divisions (Operations of cellular telephone sales shops in China) allowed sales of the Solutions Segment to rise by 27.8% year-on-year. With regards to profits, an increase in the sales composition of low profitability Solutions Segment (Rose from 51.0% to 60.3%) which suffered from the burden of anticipatory investments caused gross income margin to decline by 3.7% points year-on-year. However, a decline in sales, general and administrative expenses of 5.4% year-on-year arising from optimization of advertising allowed operating income to rise by 15.7% year-on-year to ¥219 million. Furthermore, improvement in non-operating income arising from declines in commissions and reductions in taxes due to the sales of equity accounting method affiliate in China allowed parent net income to rise by 84.2% year-on-year to ¥327 million. The contents service business benefitted from increases in sales of traffic information provided to smartphones (Monthly fee services rose by ¥72 million), games (Fixed rate carrier services rose by ¥21 million) and other contents. However, sales of overall carrier platform services (Entertainment, games, mail, music, digital publications, and overseas) declined, including monthly subscription basis contents, and carrier fixed rate services which declined by ¥172 and ¥75 million respectively. At the same time, the Solutions Segment saw a 37.3% year-on-year increase in sales of the solutions services subsidiaries including 4QUALIA Co., Ltd., and One Inc., and Aizu Laboratory, Inc., (Consigned development, others), and a 11.7% year-on-year rise in sales of advertising to a record high due to extraordinary demand ahead of the implementation of regulations on cellular handset sales and successful efforts to cultivate new sales agencies. Efforts to strengthen sales to corporate clients allowed handset terminal sales volumes and overseas sales to rise by over 190% and 58.0% year-on-year respectively. While an increase in the number of consolidated subsidiaries caused labor and other items to grow, optimization of advertising efficiency allowed advertising expenses to decline and led to an overall decline in sales, general and administrative expenses. During the fourth quarter between March to May, sales rose to a record high level on a quarterly basis on the back of strength in the Solutions Segment, allowing sales to grow on both year-on-year and quarter-on-quarter basis. With regards to profits, reductions in advertising expenses derived from changes in advertising strategy allowed sales, general and administrative expenses margin to improve. At the same time, increases in sales and anticipatory investments of the solution business led to a rise in the cost of sales margin and caused operating income to decline on both a year-on-year and quarter-on-quarter basis. However, the booking of subsidy income allowed ordinary income to rise on a year-on-year basis. Deterioration of advertising effectiveness during the fourth quarter led to measures to increase the effectiveness of advertising spending, but carrier platform contents (Monthly charge and fixed rate chare services) sales declined on both a year-on-year and month-on-month basis. At the same time, sales of traffic information and lifestyle contents appear to have bottomed in the fourth quarter. During the fourth quarter, sales of the Solutions Segment (Consigned development, others) rose to a record quarterly high. In addition, advertising sales was able to rise by 53.0% year-on-year despite fears of a decline due to a rebound from the extraordinary demand seen during the third quarter. Moreover, corporate demand in the overseas division continued to trend strongly. Declines in other marketable securities arising from the sale of investment securities contributed to a ¥270 million decline in total assets from the end of the previous term to ¥6.017 billion at the end of the current term. Declines in cash and equivalents, software (For services platform creation in the Solutions Segment) and increases in long term deposits were recorded on the asset side of the balance sheet, and declines in both deferred tax liabilities (Noncurrent liabilities) and net assets were also recorded. Capital adequacy, current and noncurrent ratios rose from 81.6% at the end of the previous fiscal year to 83.5%, from, 62.1% to 63.5% and from 25.5% to 26.7% respectively. Improvements in capital efficiency and declines in tax payments allowed operating cash flow to turn from a net outflow in the previous term to a net inflow of ¥178 million in the current term. At the same time, the margin of net outflow of investing cash flow expanded due to acquisition of long-term deposits and investment securities as part of Nihon Enterprise's cash management strategy. However, free cash flow actually turned to a net inflow in real terms. Financing cash flow turned from a net inflow in the previous term to a net outflow in the current term due to dividend payment (An inflow in the previous term was recorded on the back of a public offering of shares). Nihon Enterprise's earnings estimates call for sales to decline by 4.2% year-on-year to ¥5.3 billon on the back of continued difficult conditions in the Contents Service Segment caused by changes in the contents market environment and despite the outlook for continued strong demand for the Solutions Segment (Consigned development and others). At the same time, these estimates also includes expectations of a decline in advertising sales due to the disappearance of extraordinary demand recorded during the term just ended and a conservative outlook for the overseas division. With regards to profits, a peaking of developmental investments and changes sales composition are expected to allow gross margin of the Solutions Segment to improve. Also, reductions in sales, general and administrative expenses derived from changes in advertising strategy are expected to allow operating income to rise by 50.2% year-on-year to ¥330 million. Net income attributable to the parent company is expected to decline due to the disappearance of extraordinary income arising from the sale of investment securities booked in the previous term. Dividend payment of ¥3 per share is anticipated at the term end. Nihon Enterprise provides five main contents within its Contents Service Segment. And within the Solutions Segment, application development, system creation, audio and new technologies are provided as part of a total solutions package that positions Nihon Enterprise as a "one stop" comprehensive solutions services provider that can leverage its group's strengths to cultivate demand. 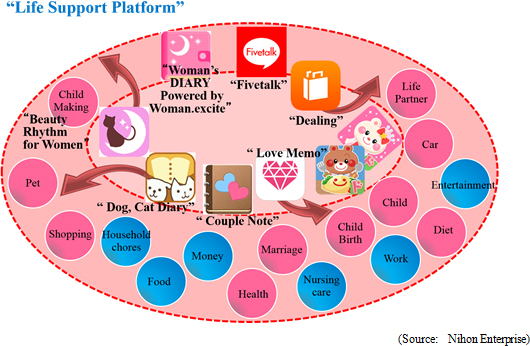 Nihon Enterprise has strengthened its alliances to the expand the healthcare application "Woman's DIARY", flea market application "Dealing", and messenger application "Fivetalk" within its lifestyle category of contents, comprehensive digital publications service "Booksmart" within its entertainment category, and traffic information "ATIS" as constituents of its five main contents categories. At the same time, efforts are being made to introduce new contents and fortify services, along with measures to produce hit contents and promote platforms. Efforts are being conducted to "strengthen alliances" and "expand coverage", and to promote the formation of a life support platform. With regards to alliances, a collaborative agreement was formed with Tanita Corporation for the healthcare application "Women Rhythm Pocketbook" on January 21, 2016 for cooperation on body composition devices (Tanita body composition meter will be connected to the "Women Rhythm Pocketbook" by Bluetooth to provide health support function service). On April 4, 2016, joint operations for "Women Rhythm Pocketbook" Powered by Woman.excite" was started through a collaborative agreement formed with Excite Japan Co., Ltd.. In addition, the messenger application "Fivetalk" began being provided across Toyota Motor Corporation's next generation telematics service "T-Connect" on June 25, 2015. In the future, efforts to strengthen alliances will continue to be implemented. In addition, the business realm coverage will be expanded by leveraging know-how in the healthcare, intellectual training application development to expand coverage to the marriage and child raising services realms. Furthermore, efforts are being made to create an individual electronic commerce system based upon the flea market application "Dealing" which was acquired on December 1, 2015. In addition to increasing the popularity of carrier fixed rate services including "Sugo Toku Contents", and the simple to play native game applications "Chokotto Game", which have been introduced as part of the advertising strategy and as new games, efforts are being made to strengthen cooperation with the "Tokyo City Book Shop Association" and services are being fortified to expand member numbers as part of efforts to strengthen the digital publication "Booksmart" service. The "Tokyo Book Award" writer cultivation and development support project "Tokyo City Book Shop Association" will be started on June 10, 2016 (Projected date) through a collaborative effort with the "Tokyo City Book Shop Association". In addition, efforts to expand member numbers by provision of browser viewers to smartphone, tablets and personal computers have also been launched, while provision had traditionally been limited to only application viewers. Furthermore, rental and all you download services have also begun being provided. Aside from these developments, Nihon Enterprise became a partnering company in Sharp's mobile type robot telephone called "RoBoHon" from May 10, 2016. In the future, the Company will begin distributing contents across Softbank's new platform called "Pepper". The monthly fees received the some 200,000 registered users of traffic information is part of the stable earnings base of Nihon Enterprise, and efforts are being made to grow earnings and stability provided by this revenue stream by increasing customer engagement through the addition of new functions and by distributing this contents across new platforms (Currently distributed across carrier platforms). In addition to the traditional BtoB distribution (Contents Service Segment), efforts are being made in the realm of BtoBtoC (Solutions Segment). As part of the BtoBtoC distribution service, the bus location service of the Keihin Kyuko Bus Co., Ltd., and data transmission service of Television Kanagawa Inc. have been started in March and April 2016 respectively. Application development, system creation, audio and new technologies capabilities provided as part of a total solutions package will be leveraged to cultivate consigned development demand for customized versions of corporate messenger application "BizTalk", IP application "AplosOne", reverse auction "Profair" and other applications, and to invigorate regional economies and expand the advertising (Ad agency services) services realm. In light of the expansion in corporate investments for information system development, the strength of comprehensive solutions services is being leveraged to cultivate new clients in the realm of consigned development and has led to demand for "declining birthrate countermeasure" and "tourism promotion" measures from parties concerned with regional economy invigoration. With regards to regional economy invigoration, the capital participation agreement with Smart Value Co., Ltd. (JASDAQ Listing, code number 9471), which conducts cloud solutions and mobile communications businesses in the Kansai region, is being leveraged to cultivate projects and pursue synergies. With regards to packaged services, functionality and usability of the corporate messenger application "BizTalk" and IP application "AplosOne" are being strengthened as a means of expanding the user base. In addition, seminars are being conducted to cultivate customers for the reverse auction "Profair" application. Efforts are also being made to expand sales of the kitting support tool "Concerto" for smartphones along with the introduction of partner systems as a means of expanding sales channels. Moreover, measures are being conducted to cultivate new users of the educational cloud "e Manabi (Learn)" service launched in July 2016. "All You Can View Movies, Drama, Animation", "Travel Guide", and other services as part of the superior contents provision service launched in fiscal year May 2016 will leverage the characteristics of each content to cultivate new sales channels. Furthermore, ongoing efforts to fortify the superior contents and form alliances will be conducted. Aside from the above-mentioned developments, efforts to develop home energy management system (HEMS), smart agriculture, and drone research are being conducted. Inaseri Co., Ltd. was established on June 3, 2016 as a 100% owned subsidiary of Nihon Enterprise for planning, development and operations of the electronic commerce service called "Inaseri". Inaseri Co., Ltd. has formed a collaborative partnership with the Tsukiji Fish Market of the Metropolitan Central Wholesale Market and the Wholesale Cooperative of Tokyo Fish Market. In this collaboration, "Inaseri" e-commerce service will begin providing services for the Tsukiji Fish Market of the Metropolitan Central Wholesale Market from November 2016 upon its relocation from the Tsukiji to Toyosu region of central Tokyo. "Inaseri" is a service of the Wholesale Cooperative of Tokyo Fish Market that allows for fresh fish and seafood suppliers to conduct e-commerce transactions directly with restaurant operators. Wholesalers post information about products expected to be sold on the next day on the "Inaseri" website for customers to order. If orders are placed by 2AM, seafood products will be delivered within the same day. The fresh fish and seafood posted on the website are processed by wholesalers handlers, then aggregated at the purchasing station within the Toyosu Market, and in the final step of the process shipped to clients using Nippon Express Co., Ltd. for arrival at restaurants within the next day. Sony Payment Services Inc.'s system called "e-SCOTT Smart" will be used and allows for payments by credit card or bank account automated transfer. 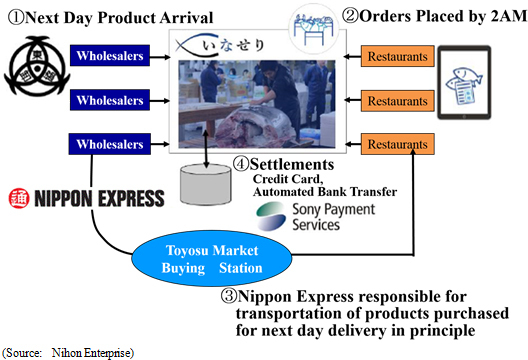 The Wholesale Cooperative of Tokyo Fish Market will leverage this "Inaseri" service to promote transactions of products with restaurant operators through sales representatives as a service of the site (http://inaseri.net/), which will be responsible for planning, development and operations, in addition to the provision of customer support. Moreover, marketing and public relations will be conducted along with cultivation of new customers within the restaurant industry. Initially, the service will be provided to restaurant operators within the Kanto region (Tokyo and the surrounding seven prefectures), with the prospect of expanding operations throughout Japan and overseas in the medium- to long-term. An agreement has been formed with the Wholesale Cooperative of Tokyo Fish Market for the provision of electronic commerce support to some 600 member companies of the Cooperative. "The value of Tsukiji equals the value of its wholesalers", and the "value of wholesalers" needs to be maintained even after their relocation to Toyosu, or rather enhanced through the provision of new functions. In other words, the "Inaseri" e-commerce service will not weed out wholesalers; it will rather cultivate new demand. Initially, the service will be launched with about 30 wholesalers products, and will gradually be expanded. The target of "Inaseri" is to cultivate restaurant operators who are not using Tsukiji Fish Market wholesalers currently, and to gradually cultivate new users including school meals and corporate cafeterias. While the large increase in profits derived from optimization of advertising expenses stood out during fiscal year May 2016, the launch of the "Inaseri" electronic commerce service and regional economy invigoration services contributed to a large decline in profitability of the Solutions Segment. However, the anticipatory investments are expected to have peaked and profitability of the Solutions Segment is expected to recover. And while Nihon Enterprise's earnings estimates call for sales to decline by 4.2% and operating income to rise significantly by 50.2% year-on-year in the coming fiscal year, further efforts to optimize advertising expenses are expected to allow this rise in profits to be achieved despite a decline in sales.